Jordan has a coastline of just 26 km at its southernmost tip, on the Red Sea. Jordan's only town on the Red Sea is Aqaba - read on for reviews of the diving centres in and around Aqaba. 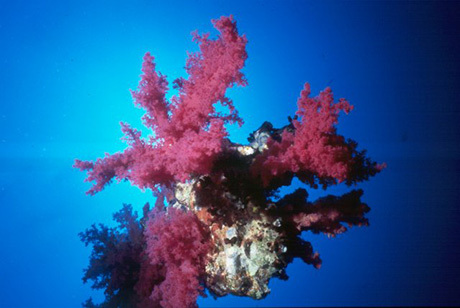 For descriptions of the dive sites of Jordan click here. You can dive all year round in Jordan, but the best time to visit is maybe October and November when sea temperatures are still warm (an average of 27 °C in October and 25 °C in November) and the weather is not too hot. You will need a visa to visit Jordan which you can get on arrival. Evidence of a previous visit to Israel—like an Israeli entry or exit stamp in your passport—does not normally cause any difficulties when entering Jordan. Jordan is an Islamic country: dress modestly and behave courteously. Although it borders Syria and Iraq in the North, the diving areas are a long way from there. For security advice see the Foreign travel advice Jordan. Click here to recommend a diving centre. Speak Arabic, English, Slovenian and Croat.
" Found an excellent dive operator and really happy to see how healthy corals they still have there! Much better than in Egypt. Can highly recommend Ahlan Aqaba Scuba Diving Center"
"Very nice organised organisation with a Beautiful boat and Very good equipment. Very good value for money." "Cost of diving is 35JD for one dive with full equipment (certified) or 350JD for the openwater course. I would definitely dive with them again, they are friendly and professional. Having dived in Egypt, South Africa, Thailand and Australia I would say these were the best dives, with the best visibility, varied wildlife and fun dive centre! " "For Jordan diving contact "Dive Aqaba" Knowledgable and well run. " "It's great technical and recreational diving center, I did my DSAT trimix diver course with Rod, he is really nice and friendly instructor. Thank you Rod. There is also Huw, he is a really great technical dive guide, I did 125 meter depth with trustful of him. Thank you Huw"
"Brilliant. Warm, friendly and thoroughly professional. Suzie is a great instructor. Could have not done it without her." "Dive Aqaba is an owner-opererated PADI school soon to become a 5star outfit. They are friendly, excellent value for your hard earned money and what is nice to see, have the latest brand new kit. It was like diving with a family: didn't want to go home." "Just had a 10 day visit to Jordan, initially staying in Aqaba for the diving. Went through Dive Aqaba who were absolutely wonderful. They made us very welcome, had wonderful humour, were extremely organised and their kit was first class. They took us to some fantastic diving sites and it was wonderful to not be at a site which was very crowded. I felt that the diving was far more superior at this part of the Red Sea than Egypt." Previously called Aqaba Gulf Dive Center. Resort providing a range of services with diving and diving courses to instructor level. Aim to offer accommodation with a family touch. Open year-round for diving for over 10 years. "We had a wonderful experience with Aqaba Gulf Dive Center. They went beyond the call of duty in terms of hospitality and helpfulness. Mohamed was a great guide! " "All dives are from shore. The reef is close to the shore so no boat is needed. " "I found Aqaba Gulf Dive Center the best dive center in Aqaba. They offer an excellent quality of diving." A PADI CMAS diving resort. The dive centre offers diving courses, equipment rental, guidance to almost 20 dive sites along Aqaba South beach. Shore and boat dives. "I had a great time diving in Aqaba with Aqaba International Dive Center. I did my open water and advanced with them thanks to Maria and Mohamed. Totally recommended. " "Amazing dive with Aqaba International Dive Center "
"We were diving with Steve and felt looked after from start to finish. Thanks for a great day. Great value: new equipment, clean office, helpful staff . We stayed at the Golden Rose, really cheap but clean rooms. " " Almarsa Village Resort, excellent, I would stay there again "
Aqaba's longest running PADI 5 star IDC centre - offering all PADI courses from DSD to Instructor levels including 20 specialities and now PADI TecRec courses! We organise daily guided shore and boat dives to all sites in the Aqaba Marine Park. SeaStar is based at Club Murjan, a private beach club on the south coast in the reserve area and can boast 3 house reefs right out front. Club Murjan is a great place to relax between dives with on site restaurant, large swimming pool and sun terrace. We can arrange daily pick ups/drop offs from all Aqaba and Tala Bay hotels - free of charge for divers. Plus with our sister company Above and Below Adventures we can put together full diving holiday packages including accommodation, transfers, diving and excursions to other sites in Jordan. "Cost of diving including all equipment, 25 JOD ( 25 Euros). Hope I can repeat in the near future. I stayed at Hotel Radison and will stay there again if I ever return to Aqaba Gulf. " Diving with Yasmena diving and snorkelling boat, dive courses also available. "Yazan Alsaed is a very professional and nice person. Highly recomended." 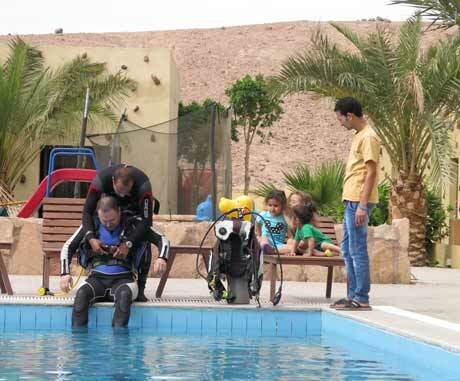 "After 2 years diving regulary in Aqaba i tried almost every diving center in Aqaba. My absolute favorite is the Yasmena boat with the diving instructor Yazan Alsead and his crew. Its a perfect diving boat, exclusive and very personal, never crowded, no rush, good equipement, extremly friendly and helpful, very professional, good food and a perfect sundeck to relax after the dives. 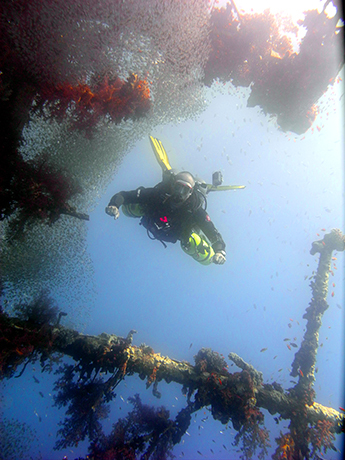 Nice and easy dive sites for beginners, but also ship wreck Cedar pride, a tank and steep cliffs. Prices are reasonable. We always have been there in groups of 3-4 people and had the boat just for us. Its still a little secret, so try it yourself!." "I am a Jordanien diver since 2003. If you have not tried diving in Aqaba with Yasmena diving boat, you have not dived in Aqaba." "My wife and I have dived with Red Sea dive Center. They are well organised and very professional. t was great to be with them and fun to be a customer. " "Excellent, new and very well maintained equipment,lovely and welcoming peolple, I would definetely dive with them again and totally reccomend. Plus: pick up and drop off at the hotel. Very reasonable cost: 40 JOD for two dives. Very special, absolutely lived up for my expectancies of the Red Sea. I hope to repeat the experience soon. " "My wife and I have just completed the PADI open water course with Red Sea Dive Center Aqaba. Abdula is a wonderful instructor and my wife was encouraged to take the course because of their well demonstrated steps to learn. This is a great place to begin and a great place to dive. " "Good value, all equipment,transport and dive information included. Genuine friendly instructors and staff make you feel very welcome and relaxed." Use the purpose-built SharksBay boat. 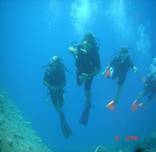 Offers PADI and BSAC courses and shore diving. Not affiliated to any hotels. Diving boat, buses, jeep, underwater communication and underwater video. Daily diving trips and dive courses from beginner to advanced levels. Teach in English and Arabic. New PADI dive centre in Aqaba located at the south beach 12km from the town. The dive centre is in a small tourist village with 16 rooms, restaurant and Bedouin coffee shop. Arrange transportation for visitors staying in Aqaba town and diving with us. Located on a private sandy beach on the southern coast of Aqaba. Offer snorkelling, daily diving and PADI courses from Bubble Maker (8-12 years of age) to Master Diver.
" Located a few miles away from the Wadi Rum Desert and Petra, Aqaba is a must see place for those who enjoy the diversity and beauty of the underwater life. Mixing the best local history, culture and food with a mild climate, the biggest treasure of this beach resort is the Red Sea itself. In here you can have some of the best snorkeling and diving experiences in the world in the company of experienced divers. Bait Al Aqaba Diving Center uses brand new, certified and top range equipment, offering a range of services that will allow you to explore the corals, sea life and beaches of the area, regardless of your level of experience. From introductory lessons aimed for beginners to advanced open water courses, Bait Al Aqaba Diving Center offers you good deals and the opportunity to see some of the most exclusive diving spots. Get your PADI certification or upgrade your diving skills in the company of locals. Bait Al Aqaba Diving Center also offers accommodation options, in our local resort located at South beach, Aqaba. Special deals that include overnight stays and diving courses are also available for those who want to plan their trip to the south of Jordan. Ahlan! Feel at home at Bait Al Aqaba. " British company offering diving packages to Aqaba. Offer group discounts for parties of more than 6. Best hotels are Movenpick and Intercontinental. Great little boutique hotel is Captains, just opened and offered by Aquatours. Hotel Radisson SAS, Tala Bay, Aqaba: I will stay there again if I ever return to Aqaba Gulf. Agoda.com often has some very good deals on hotels. A comprehensive guide to the sharks of the Red Sea. Please add your comments on diving in the Red Sea. Do you want to recommend a dive operator? Let us know.